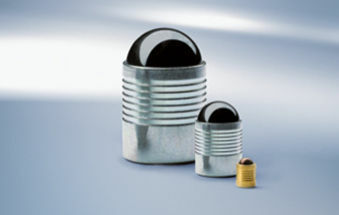 The Koenig Expander Plug is a unique system to seal holes with absolute integrity in various types of hydraulic and pneumatic components such as controls, valves, regulators, relays, cylinders, motors, presses, pumps, where hydraulic fluid or gaseous medium under pressure flow through channels in the device. These channels must be drilled from outside to connect internal passages. These drilled holes must then be sealed pressure tight to operate the device and prevent leaks. A number of other sealing methods can be used but can often be more costly and less reliable. The Koenig Expander Plug provides a safe, quick, leak-proof, and low cost method for sealing cross-drilled holes. It ensures peak performance with a comfortable safety margin even in extreme applications. They are available in five styles and in different materials. Extremely versatile and available in a variety of materials the Koenig Expander permanently resists even the most extreme pressure environments. Originally designed for use in hydraulic assemblies, the Koenig Expander plug is now well established and used in various industries across the globe in automotive, fluid power and commercial / plant vehicles. The Koenig Restrictor regulates flow with precise accuracy in hydraulics systems. The Koenig Restrictor utilises Koenig’s unique expansion technology and features a precision drilled outlet. The Koenig expansion technology provides a simple and efficient method to easily install and intergrate the Restrictor into drilled channel systems. As with all Koenig Solutions the Koenig Restrictor’s primary function is to remove time in installation and to never fail in the field. This dedication to quality ensures robust systems which maximise customer return. The Koenig Check Valve adds significant value to the flow control system. The Check Valve manages flow directions in fluid systems. Not only simple to install, as with all Koenig productivity solutions, Koenig produce check valves with optimised cracking pressures to suit customer specific application requirements; facilitating complete design and system control.